"Twenty-five states have adult obesity rates over 30 percent, putting millions of people at increased risk for heart disease, cancer and diabetes," says the latest "State of Obesity" report. “Obesity remains one of the most significant epidemics our country has faced, contributing to millions of preventable illnesses and billions of dollars in avoidable health care costs,” Richard Hamburg, interim president and CEO for Trust for America's Health, said in a news release. "Obesity continued to put millions of Americans at increased risk for a range of chronic diseases, such as diabetes and heart disease, and costs the country between $147 billion and $210 billion each year," says the release. The report, "The State of Obesity: Better Policies for a Healthier America," is issued by Trust for America's Health and the Robert Wood Johnson Foundation and is based on data from the federal Centers for Disease Control and Prevention's Behavioral Risk Factor Surveillance System, a continuous national poll. Kansas and Kentucky were the only two states to see obesity increases in 2015. Most remained steady, and four states saw a drop: Minnesota, Montana, New York and Ohio. Nine of the 11 most obese states are in the South, and 22 of the top 25 are in the South and Midwest. Louisiana has the highest obesity rate, 36.2 percent. More than half the states have obesity rates at or above 30 percent, with four above 35 percent. Obesity rates are above 20 percent in every state; in 1991, no state had a rate above 20 percent. The authors outline a set of policy recommendations to combat obesity, including: investment in obesity prevention; focusing on early-childhood and school-based policies and programs that support healthier meals, physical activity and less screen time; prioritizing active transportation planning and access to healthy foods in communities; and covering a full range of obesity prevention, treatment and management services under all public and private health plans. “These new data suggest that we are making some progress but there’s more yet to do. Across the country, we need to fully adopt the high-impact strategies recommended by numerous experts," Hamburg said. "Improving nutrition and increasing activity in early childhood, making healthy choices easier in people’s daily lives and targeting the startling inequities are all key approaches we need to ramp up." Dearborn County, Indiana, which sends more people to prison per capita than nearly any other county in the nation, "represents the new boom in American prisons: mostly white, rural and politically conservative," Wright writes. 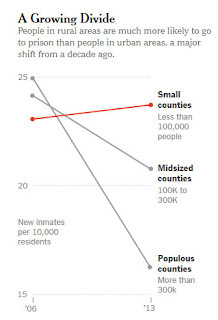 From 2006 to 2014, annual prison admissions dropped between 36 to 93 percent in Indianapolis, Brooklyn, Los Angeles County and San Francisco, "but large parts of rural and suburban America—overwhelmed by the heroin epidemic and concerned about the safety of diverting people from prison—have gone the opposite direction. 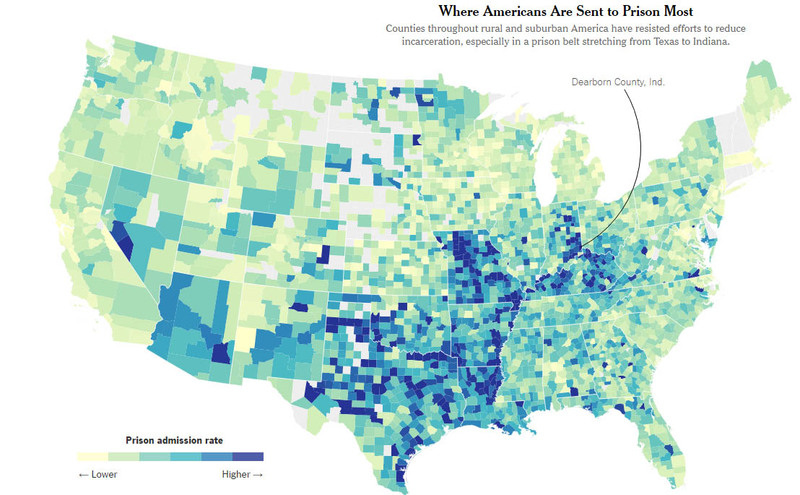 Prison admissions in counties with fewer than 100,000 people have risen even as crime has fallen, according to a New York Times analysis" from U.S. Department of Justice data. 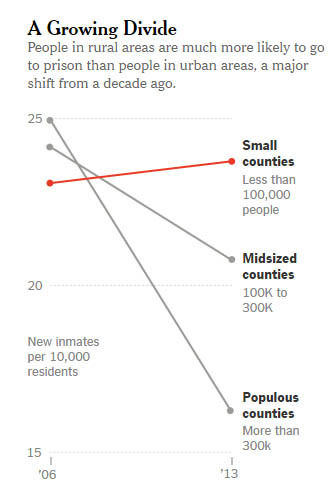 "The stark disparities in how counties punish crime show the limits of recent state and federal changes to reduce the number of inmates," Wright writes. "Far from Washington and state capitals, county prosecutors and judges continue to wield great power over who goes to prison and for how long. And many of them have no interest in reducing the prison population." Aaron Negangard, the elected prosecutor in Dearborn County, told the Times, “I am proud of the fact that we send more people to jail than other counties. That’s how we keep it safe here. . . . My constituents are the people who decide whether I keep doing my job. The governor can’t make me. The legislature can’t make me." In 2014, Dearborn County sent more people to prison than San Francisco, though the county had 49,904 people to San Francisco's 837,442. About 1 in 10 Dearborn County adults are in prison, jail or on probation. Many Americans list immigration as one of the nation's biggest concerns, especially when it comes to the 2016 presidential election. But a 2015 survey by global market research company Ipsos found that most Americans think the immigrant population is much higher than it actually is, Ana Swanson reports for The Washington Post. "On average, surveyed Americans guessed that one-third of people in their country are immigrants," when the actual figure is 14 percent. When asked about the size of the Muslim population, the average guess was 15 percent, but the actual Muslim population is 1 percent. In a more recent Ipsos survey, from last month, 49 percent of Americans said they worry that immigrants have made it more difficult to get jobs. That number is up from 46 percent in October 2015, but down from 60 percent in 2011. Also, 77 percent of Americans believe terrorists are pretending to be refugees who will enter the U.S. to cause violence and destruction. There are some positives. When asked if they think immigrants play a positive role in society, 35 percent of respondents said yes, up from 18 percent in 2011. Also, 36 percent said immigration is good for the economy, up from 23 percent in 2011. For years California marijuana farmers sought to be treated like any other farmers of any other crop, but "The price of that legitimacy has been steep and it is about to redefine the nature of the marijuana industry in ways that make many of its most committed supporters deeply uncomfortable, Sara Solovitch reports for Politico Magazine. "California’s iconic counter-culture drug is about to be treated just like a six-pack of beer." "Under the new regulations, licensed distributors were given control over measurement, taxing and testing for all medical marijuana before it can move to the retailer," Solovitch writes. "The rules are modeled on the system that emerged at the end of Prohibition to wrest control from mobsters and their illegal liquor empires. States required wholesalers to bring alcohol from the manufacturer to the retailer, a system that has proven fantastically lucrative for distribution companies. Some of those players are now poised to make millions of dollars as the middlemen in California’s burgeoning medical marijuana market." "The familiar alcohol distribution model gives comfort to California law enforcement and state regulators who still view marijuana growers with suspicion, even 20 years after medical marijuana was legalized," Solovitch writes. "But it runs counter to the 22 other states that have legalized marijuana in some form where cultivators sell their wares directly to retailers." "It might also be the foundation for marijuana policy across the country," Solovitch writes. "In November, Californians will vote to legalize marijuana for recreational use, a ballot initiative that has received backing from Napster’s Sean Parker and Lt. Gov. Gavin Newsom, who’s running for governor in 2018. 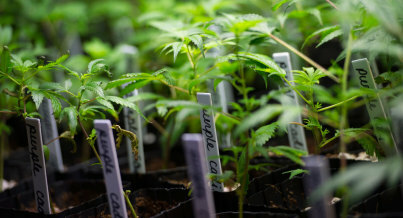 Polls indicate 60 percent support for the measure, which, if passed, is expected to grow the state’s $2.7 billion marijuana market into an industry worth $15 billion or more in five years." "Hedge fund managers, venture capitalists and savvy entrepreneurs have begun flooding into the arena, alert to opportunities for legal profits that dangled out of reach when marijuana was underground," Solovitch writes. "The sheer size of California’s market (U.S. sales totaled $5.7 billion in 2015), along with pressure from prominent marijuana policy advocates, could influence other states contemplating legalization (there are eight with measures on the ballot this fall) and permanently shape the regulatory landscape nationally." "But the transformation is causing discomfort within California’s community of renegade pot growers, many of whom worry that their long wished for legitimacy may end with them being co-opted by the implacable force of corporate America," Solovitch writes. "The price of that legitimacy has been steep and it is about to redefine the nature of the marijuana industry in ways that make many of its most committed supporters deeply uncomfortable." Guarino writes, "In parts of South Carolina, trucks trailing pesticide clouds are not an unusual sight, thanks to a mosquito-control program that also includes destroying larvae. Given the current concerns of West Nile virus and Zika—there are several dozen cases of travel-related Zika in South Carolina, though the state health department reports no one has yet acquired the disease from a local mosquito bite—Dorchester decided to try something different Sunday." "It marked a departure from Dorchester County’s usual ground-based efforts," Guarino writes. "For the first time, an airplane dispensed Naled in a fine mist, raining insect death from above between 6:30 a.m. and 8:30 a.m. Sunday. The county says it provided plenty of warning, spreading word about the pesticide plane via a newspaper announcement Friday and a Facebook post Saturday." But after the bees perished, county officials apologized for that and failing to notify local beekeepers, The Associated Press reports. Bee City USA, a bee-protection group, said in a news release that it "encourages mosquito abatement districts across the country to provide beekeepers with ample notice of planned spraying so they can protect their hives as much as possible by covering them or moving them to a non-spray zone. 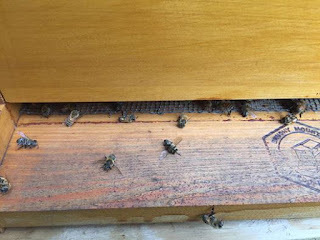 By the same token, we encourage beekeeping chapters to meet with county officials in charge of vector control as soon as possible and each year to discuss mosquito control plans that protect pollinator health, and in the event of bee kills, how beekeepers will be compensated." 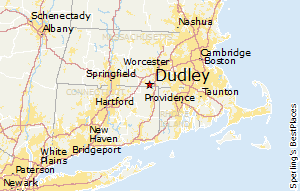 A proposed Muslim burial ground in rural Dudley, Mass., has drawn the ire of locals, Jess Bidgood reports for The New York Times. The burial ground, planned for 50 acres of unused farmland, "was denounced at meetings and ultimately turned down by the Zoning Board of Appeals, prompting charges of bigotry and drawing scrutiny from the United States attorney for Massachusetts, who announced a civil-rights investigation on Aug. 18 into the town’s actions." Similar scenes have played out in other areas, most recently over a proposed mosque in Covington, Ga.
Officials in the town of 11,500—95 percent of residents are white—deny any wrongdoing, Bidgood writes. They say "they have been unfairly portrayed as biased against the Muslims, and say the society did not have standing to seek a permit for the cemetery because of a provision giving the town the right of first refusal for the tract, which belongs to a private landowner." Dee Davis, president and founder of the Center for Rural Strategies, will receive the Everett C. Parker Award from the United Church of Christ Office of Communication Inc. (OC) on Oct. 13 at the 34th Annual Parker Lecture in Washington D.C. OC said in a statement that Davis is receiving the award "in recognition of more than 40 years of work to bring telecommunications services to rural America, particularly the people of Appalachia." The annual award "is given in recognition of an individual whose work embodies the principles and values of the public interest in telecommunications and the media as demonstrated by the late Rev. Dr. Parker, OC Inc.’s founder," according to OC. The organization, founded in 1959, says "Parker was prompted by the Rev. Martin Luther King to set out to reform television stations in the south, which were doing a poor job of covering the civil rights movement." The organization says it works to "create just and equitable media structures that give meaningful voice to diverse peoples, cultures and ideas." Among and along Appalachian ridges and valleys in Tennessee, Virginia and other states is the ancestral home of a mysterious American people, the Melungeons. The dark-skinned mountaineers were whispered to be gypsies; others believed them to be descendants of Native Americans or of ship-wrecked Portuguese sailors. Though the history and settlement of the Melungeons in the Appalachian region is still unclear, the mystery their racial makeup has been solved, and at a propitious time, writes Andrew Miller of The Economist. The name Melungeon may come from the Greek word melas, meaning dark or black, or early French settlers use of the word mélange to describe them, but the name soon became a racial slur. Melungeons were no strangers to prejudice or segregation, and their ill treatment is a plausible reason as to how they settled in and around isolated Hancock County, Tennessee, 200 or more years ago. The county was, for the most part, outside the grip of Jim Crow laws. Kathy Lyday, a professor at Elon University in North Carolina, has researched Melungeons appearances in periodicals and literature for the past century. She spoke with Dale Neal from the Citizen-Times in Asheville about seeing Melungeons in newspapers as a child. "Melungeons are clearly not like the mountaineers I knew," Lyday told Neal. "They look different. They have darker skin, darker hair and blue eyes. In older photos, their physical appearance looks almost Mediterranean or Middle Eastern." 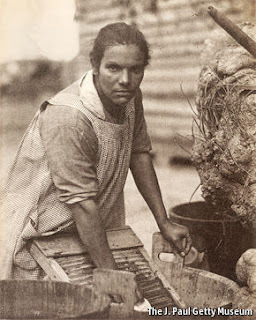 Researchers have re-defined Melungeon as tri-racial, theorizing that they are descendants of Europeans, Africans and Native Americans. In 2012, however, the Journal of Genetic Genealogy released a DNA study that reported families historically called Melungeons "are the off-spring of sub-Saharan African men and white women of northern or central European origin." Today, Melungeons stretch across East Tennessee, Southwest Virginia and into areas of Eastern Kentucky. At a time when mixed ethnic backgrounds are becoming a more comfortable topic of conversation, emerges a peculiar people who can declare they do not have the racial identity of one-half or one-third of an ethnicity. Melungeons can identify, rather, as wholly sub-Saharan African and European. The "invention" of the Melungeon race and the unraveling mystery of their origins bring new clarity to a muddy and infamous past of race relations in America, Miller writes. "There may be a deeper honesty, and a kind of idealism, in this voluntary embrace of a mixed-ethnic background—a make-up common to millions of Americans, but which many remain reluctant to acknowledge," Miller writes. "And there is something optimistic and timely about the vision of race that the Melungeons imply. These days, on university campuses and beyond, the old, humanistic faith that everyone is the same at heart has been ousted by an essentialist idea of black- and whiteness, which sees the experiences of each as distinct, even mutually incomprehensible. The grievances that underpin this attitude are often legitimate, but the result is that race in America can sometimes seem like a prison. The notion of racial categories as fluid and optional, even invented, is a refreshing counterpoint to this ossifying sense of unbridgeable difference." U.S. coal-mining employment dropped another 6.3 percent in the second quarter of 2016, representing the loss of 3,463 jobs, Richard Kuykendall and Kevin Hunt report for Standard & Poor's: "Coal mining jobs have declined 45.6 percent from a near-term market peak in late 2011 to the second quarter of 2016. In the same time period domestic coal production has fallen 43.2 percent compared to the year-ago period." 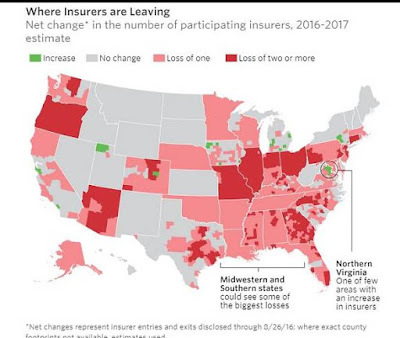 The greatest losses have been in Appalachia. West Virginia has lost 53 percent of its coal jobs—13,137—since the fourth quarter of 2011, Kuykendall and Hunt write. 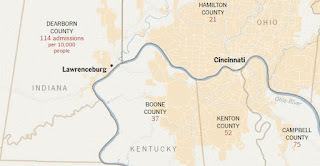 The biggest loss since then has been in Boone County, "once a center of coal mining that boasted as many as 4,608 coal miners in the final quarter of 2011, had a reported 821 reported average coal jobs in the recent quarter, a decline of about 82.2 percent." Of the 25 counties with the biggest job losses since 2011, nine are in West Virginia and eight in Kentucky. Virginia, Alabama and Pennsylvania have two each and Wyoming and Illinois each have one. "Natural gas consumption is expected to continue rising, however, and the EIA expects the U.S. will emit about 1.5 billion metric tons of carbon dioxide from natural gas in 2016, compared to about 1.4 billion metric tons from coal," Bobby Magill reports for Climate Central. "Natural gas emits about half as much climate change-driving carbon dioxide as coal." But there's a caveat. "Though natural gas burns cleaner than coal, producing natural gas and piping it to power plants leaks methane into the atmosphere," Magill writes. "Methane is a greenhouse gas more than 35 times as potent as carbon dioxide in driving climate change over the span of a century, and global atmospheric concentrations of it have been increasing steadily since 2007. That increase has been tied partly to U.S. natural gas production." The report did not account for methane leaks, which are difficult to measure. Today on MSNBC's "Morning Joe," U.S. Rep. John Lewis of Georgia, a civil-rights leader since the early 1960s, was asked to name the next big civil-rights issue. He said it was seeing that all children in America get a good education. The need for that is illustrated in Carrollton, Ga., a few miles west of his Atlanta district. 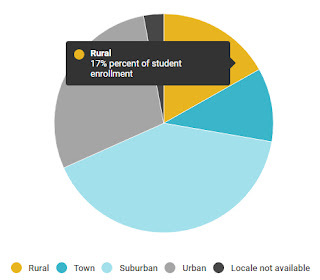 A study built on interviews with 26 students and 11 staff members at Central High School in Carrollton found that rural and impoverished African Americans have limited opportunities and resources to prepare them to attend four-year institutions. The study was published in The Review of Higher Education. The study was a collaboration of researchers from the University of Georgia, North Carolina State University and RTI International, a non-profit research and technical company in Durham, N.C.
During the 2012-13 school year, 80 percent of Central students were African American and the school had a 79 percent graduation rate—84 percent for African Americans, says the study. Also, 82 percent of students received free or reduced lunches and the county had a median family income of $34,000, with 25 percent of the population living below the poverty level, and only 20 percent of adults had a college degree. Study participants expressed concern about going to a four-year school because many had never been far from home before, they were worried about how they would pay for college and who would look after impoverished relatives. Those who visited universities said they saw a lack of African Americans on campus. Students also showed a lack of knowledge about the costs of college (one thought it costs $40,000-$60,000 a year) and had little understanding about the workings of grants, scholarships and other financial aid. They also voiced concern about academic preparedness, with Central not offering advanced-placement classes. "The rural environment shaped students’ perspectives on career and higher education opportunities available to them," researchers wrote. "Regardless of the student participants’ career aspirations, they believed there were limited opportunities available in their community to pursue their aspirations. These perceptions of limited opportunities were embedded in the economic characteristics of the county where Central High School is located. Many students perceived the fast food industry and retail industry (small-box and large-box retail stores) to be the dominant industries in their community, which shaped students’ career knowledge of opportunities available in the community." The U.S. Department of Health and Human Services announced Wednesday that 44 states and four Native American tribes will receive $53 million to fight opioid addiction. HHS said in a statement that funds will be used "to improve access to treatment for opioid use disorders, reduce opioid-related deaths and strengthen drug-misuse prevention efforts. In addition, funding will also support improved data collection and analysis around opioid misuse and overdose as well as better tracking of fatal and nonfatal opioid-involved overdoses." The U.S. Department of Agriculture in June announced $1.4 million in funding for five Appalachian projects to fight opioid addiction. President Obama earlier this year asked Congress for $1.1 billion in new funding over two years to expand treatment for the epidemic. Access to broadband might not be as important to rural, non-farming entrepreneurs and the creative class as people think, says a study by researchers at Oklahoma State University, published in The Review of Regional Studies. Researchers Brian Whitacre, a professor and extension economist at OSU, and Ph.D. student Kelsey Conley found that high levels of broadband access could actually "serve to reduce the numbers of entrepreneurs and creative class employees in rural America." The study used federal data "to compare the relationship between broadband adoption/availability and creative class and entrepreneurs both over a period of time (2000 through 2011-12) and during a specific period of time (2011-12)," Whitacre and Conley write for the Daily Yonder. 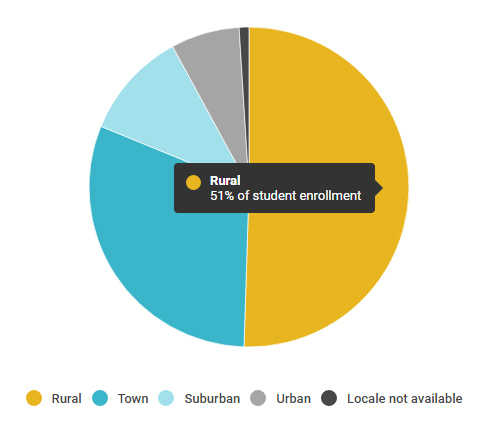 The study centers on two maps, one of rural counties that have the highest levels of entrepreneurs and creative class workers (above) and one of rural counties that have the highest levels of broadband availability and adoption (below). 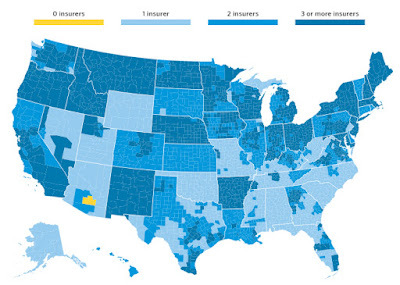 Researchers say the maps don't overlap in the way one might expect. "Characteristics that were controlled in the study included factors such as age, race, education levels, unemployment rates, the existence of natural amenities that can effect development patterns, and the percentage of workers who were engaged in agriculture or manufacturing," Whitacre and Conley write. "The study also used a spatial technique that helps eliminate the impact that neighboring counties might have on broadband deployment and adoption." "Even after all these other factors were considered, we typically found negative relationships between broadband and entrepreneurship," Whitacre and Conley write. "When it comes to broadband adoption, we found that high levels of broadband adoption in non-metropolitan counties are associated with lower levels of creative-class employees. Similar negative relationships were found between broadband adoption and entrepreneurs in non-metropolitan counties." The same negative findings existed for broadband availability. Hazel Zimmerman was one of the 30 arrested. Thirty people were arrested in Iowa on Wednesday protesting the Dakota Access Pipeline. Republican Gov. Terry Branstad announced Monday that he had authorized the Iowa State Patrol "to make arrests and ensure that construction of the Dakota Access Pipeline proceeds if protesters follow through on a pledge to engage in civil disobedience in a bid to stop the $3.8 billion project," William Petroski reports for The Des Moines Register. Protesters have halted construction of the pipeline in North Dakota. The 1,150-mile pipeline is expected to carry as much as 570,000 barrels of Bakken Formation crude from North Dakota through South Dakota and Iowa to a pipeline junction in Illinois. It will run through 18 Iowa counties. About 100 people participated in the Iowa protest, Petroski writes. "The protest represented one of the largest demonstrations yet in Iowa against the four-state pipeline project. It also was the first time a formal effort was made to encourage a large number of arrests in a bid to obstruct construction work in Iowa. Organizers vowed afterward that additional demonstrations will be forthcoming, along with more arrests. Their efforts appeared to have little effect Wednesday on stopping the pipeline construction project. But the people taken into custody said they were acting as a last resort because efforts to prevent the pipeline have repeatedly failed in proceedings with state and federal government regulators, as well as the courts." A pilot program in Kentucky that gave employees money to spend on fresh, local produce boosted their health and local agriculture, Janet Patton reports for the Lexington Herald-Leader. Tim Woods, a University of Kentucky agriculture marketing professor, introduced the idea to the UK Health and Wellness program last year, backing it up with data from research he did in 2015 that found people who eat local, fresh produce are healthier. Woods's study, published in the International Journal of Agricultural Sustainability, found that the 95 people who got shares in community supported agriculture, which provides participants with a weekly allotment of seasonally available produce, eggs and meat, reported a long list of positive lifestyle changes. Those included eating out less often, increasing their daily consumption of fruits and vegetables, and a decrease in prescription costs and doctor visits. "Most importantly, their monthly expenditure at the pharmacy dropped from an average of $33.84 to $17.23, almost a 50 percent decrease," Patton writes. Also, the average number of doctor visits during the six-month program dropped to two from almost seven and a half. Woods's work prompted UK Health and Wellness decided to create its own voucher pilot with 200 CSA shares. Soon after, Appalachian Regional Healthcare in Hazard and Hospice of the Bluegrass joined in. “We are a self-insured plan so the cost of keeping someone off medication is certainly paying for the cost of her food box," hospice CEO Liz Fowler told Patton. And it's good for farmers Patton reports: "This year’s program resulted in about $100,000 in new sales for local farms, Canon said." Traffic deaths are going up, and higher speed limits in rural areas are being blamed as one reason. The National Safety Council issued a report this week saying that traffic fatalities have risen dramatically for the second straight year. Its preliminary estimates "indicate motor vehicle deaths were 9 percent higher through the first six months of 2016 than in 2015, and 18 percent higher than two years ago at the six month mark," a press release said. "An estimated 19,100 people have been killed on U.S. roads since January, and 2.2 million were seriously injured." With gas prices 16 percent lower this year compared to 2015, the increase in fatalities can be attributed in part to people putting in more time on the road, the council told Fredrick Kunkle of The Washington Post. "The mileage people have driven is up 3.3 percent because of cheaper gas and a decent economy . . . but that’s half the story," Kunkle writes. "Part of the reason for the increase in traffic deaths is also that speed limits have gone up," mainly because of demands from rural residents. The Insurance Institute for Highway Safety said higher speed limits killed 33,000 people from 1993 to 2013. Many states have raised or sought to raise highway speed limits this year, including Wyoming, Oregon, Iowa and Michigan, despite concern from safety groups. Deborah A.P. Hersman, who chaired the National Transportation Safety Board from 2009 to 2014, told Kunkle that she has little doubt that the increase in traffic deaths can also be attributed to the distracted driving and the ubiquitous use of smartphones and other technology in people’s cars. Kunkle notes, however, that there is no definitive link, "perhaps because crashes are reported in a way that doesn’t capture the impact of distracted driving." Fatalities on U.S. highways increased 7.2 percent in 2015, the largest one-year increase since 1966, says a report released Tuesday by the U.S. Department of Transportation. Last year 35,092 people died in traffic fatalities on U.S. highways, up from 32,744 in 2014. The number of injuries increased from 2.34 million to 2.44 million. 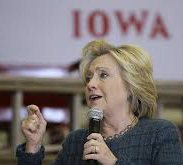 If Clinton can't win Iowa, where Obama won working-class whites, whither her party? For Trump, "who has built his campaign upon winning the allegiance of white voters on the low end of the income and education spectra, Iowa is a bellwether. If he can’t win in Iowa, it could signal that his populist message isn’t strong enough to win the White House," Epstein writes. "For Mrs. Clinton, failing to maintain Mr. Obama’s hold on white voters without college educations would be the latest sign that the Democratic Party has lost its hold on rural America in one of the few places where it still had appeal." The state's demographics indicated that "Trump should prevail—92 percent of the population in Iowa is white and just 26% have college degrees. But his campaign is understaffed and trailing Mrs. Clinton’s ground organization just a month before early voting begins here," Epstein reports. "Clinton has a decided tactical advantage on the ground. Mr. Trump has 18 Iowa staffers and the Republican National Committee has another 41, while Mrs. Clinton has more than 100 spread across 25 field offices in the state. Mr. Trump’s team is only now recruiting county chairmen for his campaign." UPDATE, 4:30 p.m.: The U.S. Supreme Court refused to stay the effect of the appeals court's decision, meaning that it will remain in effect for this year's election. When Republicans took control of North Carolina's government in 2013, they passed an election law that critics said would lead to the suppression of black votes. Last month a federal appeals court overturned much of the law, "saying it had been deliberately intended to discourage African-Americans from voting." Now the state's election boards, which the law made majority Republican, are being accused of "staging an end run" around the ruling, which "they are supposed to carry out," Michael Wines reports for The New York Times. "Like the law that was struck down, say voting-rights advocacy groups and some Democrats who are contesting the rewritten election plans, many election plans have been intentionally written to suppress the black vote." A good example is in rural Lenoir County, population 58,914, where "Democrats outnumber Republicans by better than two to one, and four in 10 voters are black," Wines writes. The two Republicans on the county board of elections have proposed allowing "106.5 hours of early voting before the Nov. 8 election—less than a quarter of the time allowed in the 2012 presidential election—and to limit early balloting to a single polling place in the county seat of a largely rural eastern North Carolina county that sprawls over 403 square miles. The election plan limits voting to a single weekend day, and on weekdays demands that residents, including those who are poor and do not own cars, make long trips to cast a ballot." "The roots of North Carolina’s latest conflict over voting seem apparent," Wines writes. "Republicans and Democrats here are in hand-to-hand combat this election year as seldom before. Contests for president and United States senator are neck and neck, and the Republican governor, Pat McCrory, is in a tough bid for re-election. Two congressional races are unfolding in districts whose boundaries were ordered redrawn this year after a federal court ruled that they had been gerrymandered to dilute black voters’ influence." The controversial Dakota Access Pipeline was approved by the U.S. Army Corps of Engineers despite environmental objections from three federal agencies, Phil McKenna reports for InsideClimate News. The Environmental Protection Agency, the Department of the Interior and the Advisory Council on Historic Preservation all "raised serious environmental and safety objections to the North Dakota section of the pipeline, the same objections being voiced in a large protest by the Standing Rock Sioux tribe that has so far succeeded in halting construction." Native Americans say they fear a leak would harm their main source of water, the Missouri River. While construction has been halted around Cannon Ball, N.D., it continues in other states. The $3.8 billion, 1,150-mile pipeline is expected to carry as much as 570,000 barrels of Bakken Formation crude from North Dakota through South Dakota and Iowa to Illinois. "Citing risks to water supplies, inadequate emergency preparedness, potential impacts to the Standing Rock reservation and insufficient environmental justice analysis, the agencies urged the Army Corps to issue a revised draft of their environmental assessment," McKenna writes. 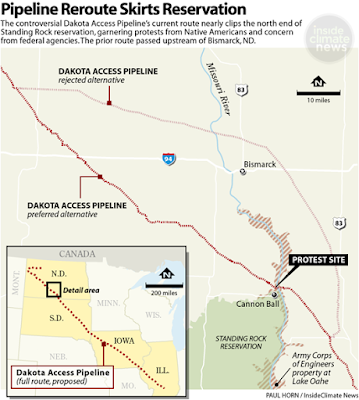 The Army Corps instead "relied on an environmental assessment prepared by the pipeline's developer, Dakota Access LLC, when it approved the project in July, according to public documents." Fear of not appearing manly leads men to resist "green" products, says a study at the University of Notre Dame published in the Journal of Consumer Research. The study, which included a survey of 127 college students, a quiz taken by 194 students and two observational studies, found that men in the research generally associate anything environmentally friendly with being feminine and shy away from it. Study authors wrote: "Men’s resistance may stem in part from a prevalent association between the concepts of greenness and femininity and a corresponding stereotype (held by both men and women) that green consumers are feminine. As a result of this stereotype, men may be motivated to avoid or even oppose green behaviors in order to safeguard their gender identity." The survey "asked respondents if they thought green products appeared masculine, feminine or neither," Danielle Paquette reports for The Washington Post. "Most participants, both men and women, said items designed to protect the planet seemed feminine." 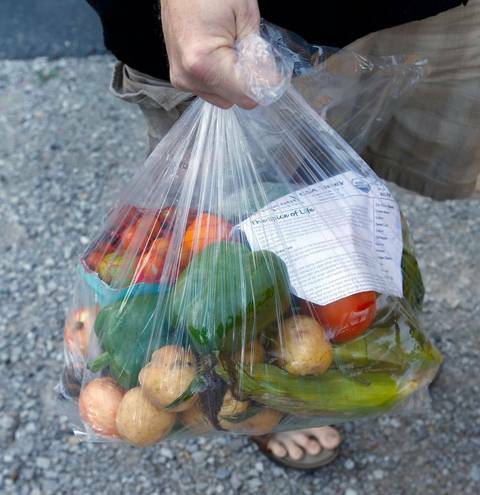 Quiz participants were instructed "to imagine two grocery store shoppers, one carrying a green reusable bag and another toting a plastic sack. The quiz asked: Which seemed more eco-friendly, wasteful, masculine and/or feminine? The green shoppers seemed to respondents more eco-friendly and feminine, regardless of their gender. The plastic shoppers came off as more wasteful and masculine." Researchers also conducted a pair of studies, Shannon Roddel reports for Notre Dame News. The first study, at a BMW dealership in China, centered around an eco-friendly car. "While surveying shoppers, the researchers simply changed the name of the car from the traditional, environmentally friendly name to 'Protection,' which is a masculine term in China. Despite all other descriptions of the car remaining the same, the name change did increase men’s interest in the car." "In another study, the team compared men’s and women’s willingness to donate to green charities," Rodel writes. "They called one 'Friends of Nature,' with a bright green logo featuring a tree. The second was named 'Wilderness Rangers' showcasing a wolf howling to the moon. Women favored the more traditional green marketing, while more men were drawn to the masculine branding over the traditional." Mushroom hunting has become the newest illegal business. Hunters can haul in large sums of money from restaurants for black morel mushrooms that grow in the spring and summer after forest fires in the West, Nicky Ouellet reports for NPR. Too many hunters are creating safety concerns—fire officials consider some of the areas still dangerous—and large crowds of mushroom hunters are leading to an increase in trash and damage. That has led Montana officials to make it illegal to pick in burn zones in any of the state's national forests. That hasn't stopped hunters like Matt Zaitz of Kansas, who says he "can sell a pound of morel mushrooms for about $20," Ouellet writes. "On a good day—which is by no means every day—Zaitz says he can bring in a harvest worth $500. He says there's potentially millions of dollars to be made off mushrooms in Western public lands, especially in burn zones the summer after a big wildfire." 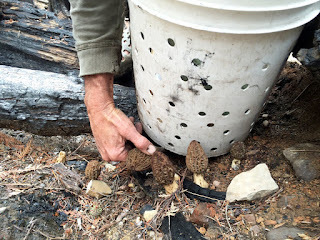 "Usually, the U.S. Forest Service offers a special license to pick morels for commercial use in burn zones. This season, the Forest Service decided to only issue personal-use permits, which limit a picker to 60 gallons for the entire season," Ouellet reports. "It also requires pickers to cut their mushrooms in half so they can't sell them." Mushroom hunters like Renee, who lives in Kalispell, Mont. typically sells "her morels to chefs at restaurants or from the back of her truck for $20 a pound," Ouellet writes. This year she said she's hesitant to sell mushrooms openly, and instead has be selling on Facebook "in what's become something like a mushroom black market. 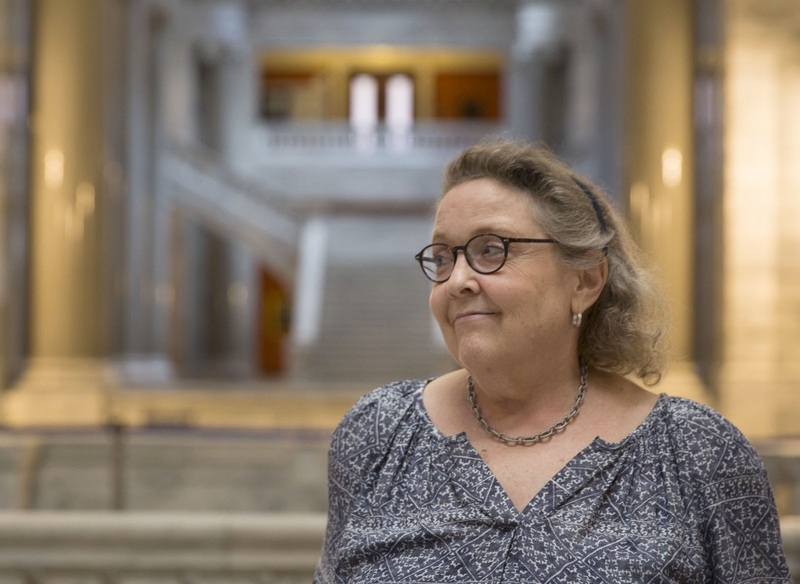 She feels the Forest Service is making her into a criminal for something she's done legally for years." She told Ouellet, "We don't want to get in any trouble, we certainly don't want to get our buyers into any trouble. We try to sell them under the radar, but it's been very difficult." 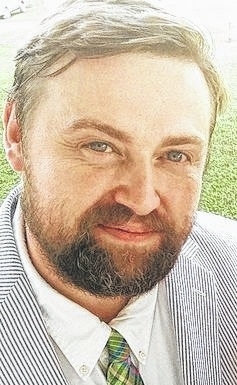 Ryan Craig, editor/publisher of the Todd County Standard, a 2,500-circulation weekly newspaper in Kentucky, hurled many barbs in a front-page column chastising the state for allowing telecom companies like AT&T to engage in public-private partnerships that never follow through on providing broadband to rural and remote areas. "Why, oh why, is the Commonwealth of Kentucky determined to proceed to have public-private partnerships with quasi-utilities when the promises are not as promising for as for Eastern Kentucky, are vague for Western Kentucky and even more murky for Todd County on getting good internet services in the places that need it most?" Craig writes. 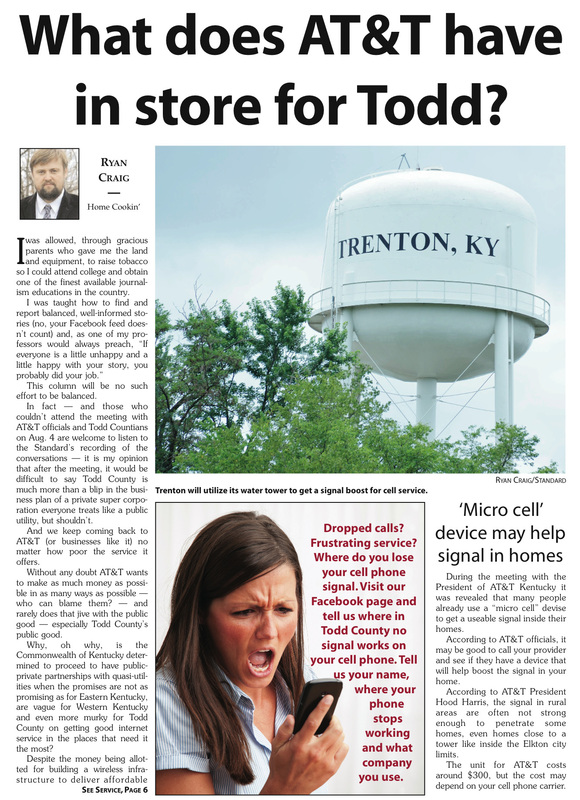 "Despite the money being allotted for building a wireless infrastructure to deliver affordable internet for all counties in Kentucky, the sticking points seem to be if the move is worth the time of companies like AT&T or Verizon who already have infrastructure in the majority of the state," he writes. 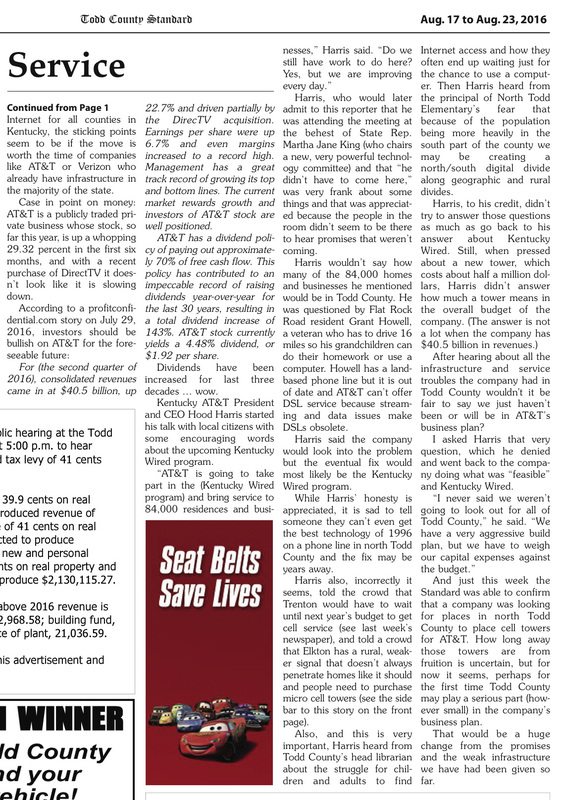 Hood Harris, president and CEO of Kentucky AT&T, recently met with Todd County citizens about Kentucky Wired, a state project designed to connect 84,000 residences and businesses, Craig writes. Harris refused to say how many of those 84,000 homes and businesses would be in Todd County, which has a population of 12,503. Harris answered most questions by referring them to Kentucky Wired or saying he would look into it, Craig writes. That includes a complaint from residents who must drive 16 miles for their grandchildren to use a computer with internet access, and a librarian and educator who expressed concern about a lack of options for libraries and schools. To see the Standard's Facebook page, with complaints from readers about poor service, click here. "After hearing about all the infrastructure and service troubles the company had in Todd County wouldn't it be fair to say we just haven't been or will be in AT&T's business plan?" Craig asks on the story jump. "I asked Harris that very question, which he denied and went back to the company doing what was 'feasible' and Kentucky Wired." Minnesota Democratic Gov. Mark Dayton on Friday issued an executive order limiting the use of neonicotinoid-based pesticides that have been partly blamed on declining bee populations, Dan Gunderson and Elizabeth Dunbar report for Minnesota Public Radio. 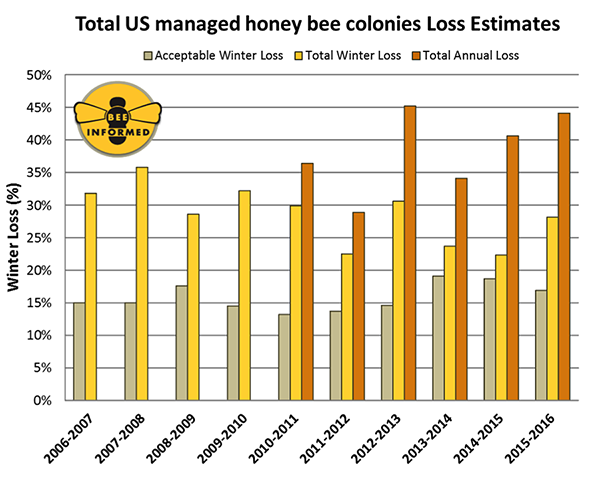 Honeybees lost 28 percent of colonies last winter, up from 22 percent the year before. Deaths are blamed on varroa mites, pesticides, disease and poor nutrition and food supply. 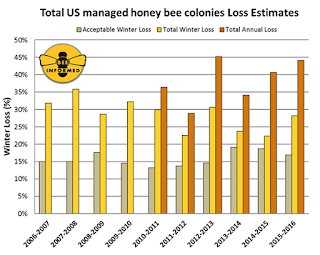 Bees are responsible for more than $15 billion in increased U.S. crop value each year. A University of Minnesota study released Friday found that neonicotinoids make queen bees less active, making them lay fewer eggs. Dayton's decision was based on recommendations from a two-year study by the Minnesota Department of Agriculture, Gunderson and Dunbar write. The executive order calls for: "Demonstrated need for pest control before neonicotinoid insecticides can be applied. That means a there must be a level of pest infestation high enough to cause economic damage to the crops" and "Increased inspection and enforcement to make sure users follow label restrictions designed to protect bees." The Minnesota Corn Growers Association said in a statement that "pollinators play a crucial role in the health of our agricultural economy ... restrictions on the use of neonicotinoids that adversely affect farmers ability to make a living should be evaluated and implemented carefully," Gunderson and Dunbar write. Bayer Crop Science, which makes two of the most common neonicotinoids said in a statement that it supports efforts to protect pollinators, but "taking tools from farmers without an open and transparent public discussion rooted in sound science does a disservice to everyone." What happens to a rural community when its Walmart closes? Earlier this year the nations largest grocer and retailer, with more than 4,000 locations, announced it was closing 154 U.S. stores. Of those stores 96 are in low-income, low-density and predominately rural areas, mostly in the Southeast. 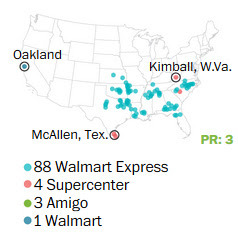 McDowell County, West Virginia, which is one of the nation's poorest counties and has one of the highest death rates from prescription-pill overdoses, saw its Walmart close, adding to the woes in a once thriving coal community. 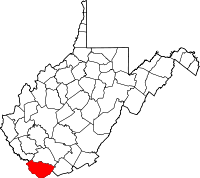 The result was that 140 people were laid off and the county lost its main grocery store, Jessica Lilly and Roxy Todd report for West Virginia Public Broadcasting. The Walmart closing also affected the local food pantry, which relied on donations from the store to help feed 11,000 people. Local residents have responded to the closing by creating a pair of farmers' markets, Lilly and Todd write. The problem is that "growing and selling local foods in the coalfields can be tough. For one thing, there aren’t a lot of customers willing to make the trek out to the farmer’s market." 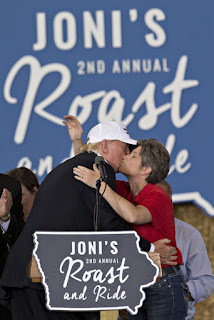 Donald Trump hugs Iowa Sen. Joni Ernst. Iowa Republicans have welcomed Donald Trump with open arms perhaps more than the GOP in any other state, James Hohmann reports for The Washington Post. Why has the battleground state, with heavy ties to agriculture and a large rural population, given so much support to the Republican presidential candidate whose controversial statements have often caused him to struggle to win over voters in his own party? "Iowa offers sort of a demographic sweet spot for Trump," Hohmann writes. "More than other states, the Democratic base is still comprised mostly of blue-collar whites. They are less educated and live in places hollowed out by deindustrialization, so Trump’s protectionist message resonates. Trump is likely to run up the score in these more beleaguered rural areas, and he’ll probably get blown out in the suburbs around Des Moines. Republicans want the crossover voters in the outer parts of the state to cast ballots for other GOP candidates." Another reason: Gov. Terry Branstad and other leading Iowa Republicans have gotten behind Trump, because his performance could affect Iowa's hotly contested House and Senate elections, Hohmann writes. "There are also two very competitive U.S. House races, where Trump’s performance at the top of the ticket may determine whether the first-term GOP incumbents survive," while Republican Sen. Chuck Grassley, who has been in office since 1974, is in a much tighter battle than expected. Thirty-one percent of Texas teachers work a second job during the school year, and 49 percent work during the summer, according to a survey conducted for the Texas State Teachers Association. The survey of 837 teachers—10 percent were from rural schools—found that teachers with extra jobs averaged working 13.1 hours per week outside of the classroom during the school year, in addition to the 17 hours per week outside the classroom spent on school-related work, a TSTA release says. Most teachers—86 percent—who moonlighted during the school year said they would like to quit the second job, but that they would need an average raise of $8,974 to do. Of those who moonlight, 72 percent said it is harmful to their quality of teaching. More than half—53 percent—of all respondents said they are considering leaving the profession. The average salary among respondents was listed as $53,147. Survey respondents also blamed the state legislature's failure to adequately fund public schools. The $75 monthly contribution made to educator insurance premiums hasn't been raised in almost 15 years, and teachers spend an average of $656 per year on classroom supplies and $326 per month on health-insurance premiums. Nationally, Texas ranks 26th in teacher pay, Julie Chang reports for the Austin American-Statesman. Data from 2015-16 from the National Education Association data shows that Texas teachers earn an average salary of $51,758—$6,306 below the national average. State education funding is $2,700 per student below the national average. 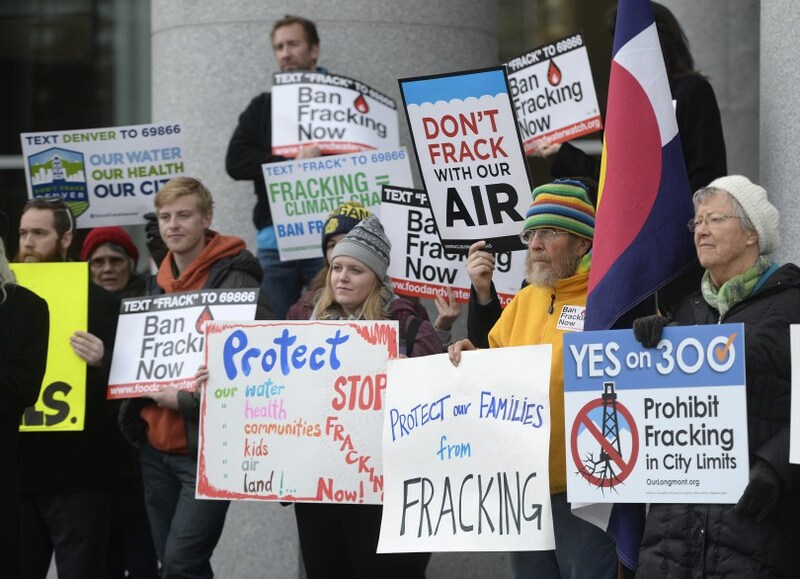 Activists in Colorado failed to gather enough signatures to get anti-fracking measures on the November ballot, Mark Matthews reports for The Denver Post. "Their goal was to put two proposals before Colorado voters: one that would prohibit energy companies from building new oil and gas facilities within 2,500 feet of homes or other occupied building and another that would give more power to local governments to restrict fracking." Petitions are required to have 98,492 voter signatures. "Opposition to the anti-fracking initiatives was fierce from the oil and gas industry," Matthews writes. "A group called Protect Colorado—which is funded by the energy sector as well as ranchers and other businesses—led an effort dubbed Decline to Sign that was intended to chill momentum for the anti-fracking effort." Colorado residents tried to get similar measures on the 2014 ballot. That move was derailed by Democratic Gov. John Hickenlooper, who has said he would do whatever it takes to keep beat anti-fracking initiatives. In May, the Colorado Supreme Court ruled against Front Range towns that wanted to pass anti-fracking measures, saying state law trumps local ones. Students eligible for school-meal programs because of their families' low incomes are more likely to attend schools that allow corporal punishment, Sparks and Harwin report. "Texas, Alabama, Mississippi, Arkansas, Georgia, Tennessee, and Oklahoma physically disciplined the most students in 2013-14—though the practice continues to be the most widespread in Mississippi, where more than half of students attend schools that use paddling and other physical discipline. But students were physically punished even in a few states that prohibit the practice." Rural residents in some states could soon lose their opportunity for broadband access via nearby towns, Cecilia Kang reports for The New York Times. "This month, the United States Court of Appeals for the Sixth Circuit upheld restrictive laws in North Carolina and Tennessee that will halt the growth" of municipal broadband networks, "which are city-run internet providers that have increased competition in the broadband market by serving residents where commercial networks have been unwilling to go." "While the decision directly affects only those two states, it has cast a shadow over dozens of city-run broadband projects started nationwide in recent years to help solve the digital divide," Kang writes. "In siding with the states, the court hobbled the boldest effort by federal officials to support municipal broadband networks. While the court agreed that municipal networks were valuable, it disagreed with the Federal Communication Commission's legal arguments to pre-empt state laws." That has led towns in about 20 states "to fear they have little protection from laws like those that curb municipal broadband efforts and favor traditional cable and telecom firms," Kang writes. "City officials say cable and telecom companies that have lobbied for state restrictions will be encouraged to fight for even more draconian laws, potentially squashing competition that could lead to lower prices and better speeds to access the web." "Some lawmakers and free-market-oriented think tanks say public broadband projects should be carefully scrutinized by local regulators because they are costly and, if unsuccessful, can be a financial burden on taxpayers," Kang writes. "In addition, FCC cannot intervene in state laws, they said." An FCC spokesman said the agency has no plans to appeal the decision. "That means municipalities that want to keep expanding their municipal broadband networks will have to fight to overturn state laws on their own," Kang reports. Guide offers tips, resources for helping unwanted horses, estimated at 192,000 in U.S. 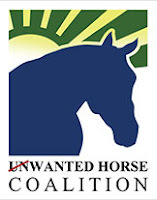 The Unwanted Horse Coalition has created a resource, "Join the Effort: Programs to Help Unwanted Horses," that "offers 16 specific strategies for groups of any size to help unwanted horses," it says in a press release. The resource also includes a list of successful programs that help unwanted horses and fundraising tips and resources. Of the 9.2 million horses in the U.S., 192,000 are considered unwanted, UHC reports. Many of the unwanted "are healthy horses that become more of a burden to their owners than a blessing because of financial limitations, time constraints, or have otherwise failed to meet their owner’s expectations. These horses can often be repurposed and rehomed. Others may be sick, injured, or old. Fewer still are unmanageable, unrideable, or dangerous." Survivalists, mostly white conservative Christians who fear everything from natural disasters to terrorist attacks to the federal government, are stocking up on guns and ammo and doling out large sums of money for remote homes in the Pacific Northwest to await an economic collapse or the end of the world as they know it, Kevin Sullivan reports for The Washington Post. They call themselves "the American Redoubt, a term coined in 2011 by survivalist author and blogger James Wesley, Rawles [who uses the comma as part of his name] to describe a settlement of the God-fearing in a lightly populated territory that includes Idaho, Montana, Wyoming and the eastern parts of Washington and Oregon." Sullivan writes, "Those migrating to the Redoubt are some of the most motivated members of what is known as the prepper movement, which advocates readiness and self- reliance in man-made or natural disasters that could create instability for years. 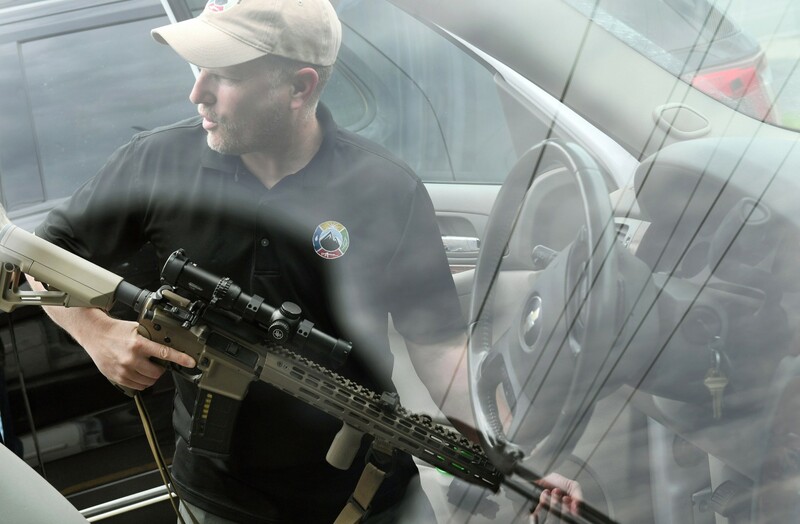 It’s scenario-planning that is gaining adherents and becoming mainstream in what Redoubt preppers described as an era of fear and uncertainty. Much of the Redoubt migration is motivated by fears that President Obama—and his potential successor, Hillary Clinton—want to scrap the Second Amendment, as part of what transplants see as a dangerous and anti-constitutionalist movement toward government that is too intrusive and hostile to personal liberties." Repealing the amendment would take two-thirds votes in Congress and approval by three-fourtsh of the states. Nevertheless, "Online interest in prepper and American Redoubt websites is increasing," Sullivan reports. "Tools that measure online readership show that monthly search traffic to Rawles’s survivalblog.com has doubled since 2011; an estimate from SimilarWeb, a Web analytics firm, shows that the site had about 862,000 total visits last month. Rawles’s guidebook, How to Survive the End of the World as We Know It and his post- apocalyptic survival novel, Patriots, have sold about 350,000 copies, according to Nielsen BookScan. They are among hundreds of available survivalist books." Sullivan writes, "They live in a pristine place of abundant water and fertile soil, far from urban crime, free from most natural disasters and populated predominantly by conservative, mostly Christian people with a live-and-let-live ethos and local governments with a light regulatory touch and friendly gun laws." Walsh, who sells real estate, said most of the prepper properties have "at least two sources of water, solar panels or another alternative energy source, ample secure storage space for a few years’ worth of supplies and a defensible location away from main roads and city centers," Sullivan reports." Properties typically sell between $250,000 to $550,000, with some as high as $2 million. A basic solar array can cost around $15,000, while more elaborate systems can cost 10 times that, Walsh said.